I suspect over the course of this blog regular readers have detected certain recurrent themes. You might have noticed my love for animals, and thus my support of our local SPCA, and my concern over the welfare of the homeless in our community, and hence my interest in the Centre of Hope. You may have noticed how often I write about places like the Wood Buffalo Food Bank, and other non-profit organizations in this community. I do so for a few reasons, I guess. I believe we as citizens have a responsibility to the others who share our community, and our world. I believe we are judged as a society by how we treat those who are vulnerable, and I want to ensure we are judged kindly in this regard. And I suppose my support of non-profits traces all the way back to my parents, who were very Catholic. What does being Catholic have to do with non-profit organizations? Well, not much really because people of all faiths - and people who do not belong to any faith - work with and for non-profits. For my parents, though, part of Catholicism and religion was "walking the talk". The words were easy, they would say, but the actions are hard. And so over their entire lives my parents were involved in helping others, sometimes through their church but often on their own, too. The religion part didn't stick with me, I guess, and the last time I was in a church would have been at my mother's funeral four years ago - but the desire to help others, and the understanding that this is not an option but a necessity, has been deeply ingrained in me. Last week I attended the 17th annual Soup Kitchen Banquet. If you aren't familiar with it the Soup Kitchen has been serving lunch meals to those in need in our community for years now. They serve at the Fellowship Baptist Church every weekday like clockwork, the doors opening at 11:30 and closing again an hour later. And in that time they serve dozens of people - averaging about 76 a day, but as the years have gone on and fortunes in this city have waxed and waned those numbers have on occasion fallen - and risen again. I suspect there is a perception that they feed only the local homeless, but this is simply not true. I learned that at the banquet when an elderly gentleman, who has been in our community since 1969, spoke of why he eats at the soup kitchen. He has a home, and he has been here for a very long time - and while he says the food is good he eats there for the fellowship, for the companionship - and that makes sense to me, because breaking bread with others is perhaps the staple of our society. It wasn't lost on me that my table mates at the banquet and I, and dozens of others, were breaking bread together while hearing stories of seeking food and fellowship at the Soup Kitchen. It wasn't lost on me that one of the most profound stories in the Bible involves food, the Last Supper of course, where Jesus broke bread with his disciples for the final time. 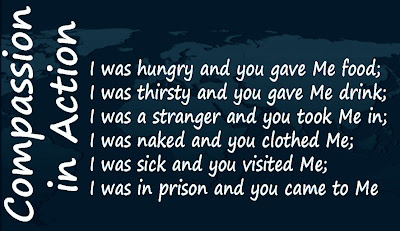 And it wasn't lost on me that while religion sets down some fundamental guidelines there is a difference between talking about them and acting on them - and that those who volunteer at the Soup Kitchen every day are not reciting religious tenets but rather living them. Every day volunteers from several different faith organizations, and those from none, serve meals to the homeless, the elderly, the new immigrants, the unemployed, and the working poor. They do so in an environment that is safe for them and their patrons, and they do so not because of glory or reward but because it is the right thing to do. They do so because food is a fundamental need, not a luxury. And they do so because I suspect, somewhere along the way just as happened to me, they learned that talk is easy but actions are what matters. Two very simple lines, and as profound as they are simple. Do unto others as you would have them do unto you. 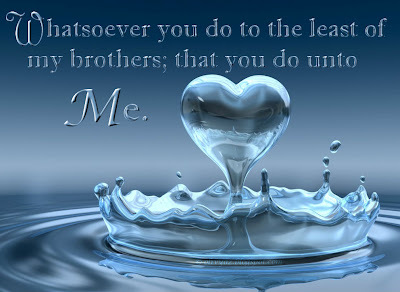 And whatsoever you do to the least of my brothers, that you do unto me - which in my life I have chosen to interpret as meaning that whatever one does to anyone else they do to me as well, because we are all connected in this world. Every act, good or bad, positive or negative, has impacts far beyond the initial result, and so every time a meal is served at the Soup Kitchen and a hungry person is fed there is a positive impact not just on them but on the rest of us. It is a ripple effect that starts in the basement of a local church and ripples out far and wide, right through this community and beyond. It was an honour to attend the Soup Kitchen Banquet, and one day I plan to see if I can spend a couple of shifts volunteering there. I always love to listen to the stories of those who share this community with me, and in the end I always find it is not those I am "helping" who truly benefit but rather me as it opens my heart and mind to others every single time. Perhaps I will break bread with some of the Soup Kitchen patrons and we will share a meal, an act that has connected us as humans likely far before we even developed language to communicate. I will leave you today with one final thought. 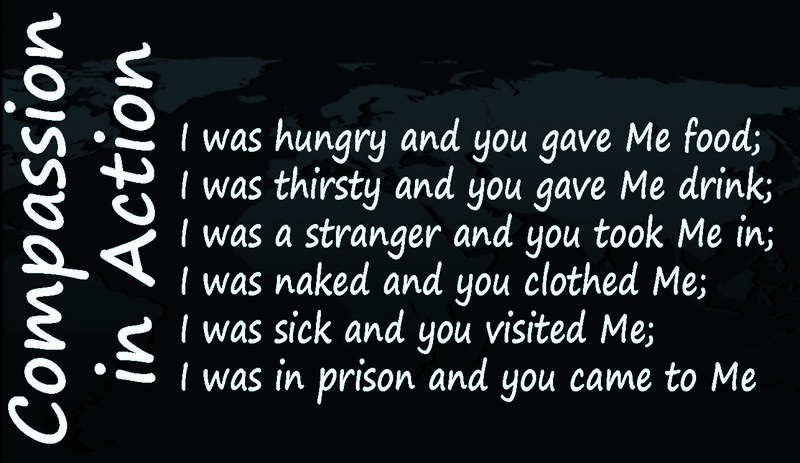 No matter how you celebrate Easter Sunday, no matter your religious belief system, no matter whether you even believe in God or not, I think this final line is pretty fundamental, because I think in the end this is what it is all about. It is all about actions, not words - and compassion.